Have a question? Check out the FAQ's. Need help with designing a shirt or setting up your store. Thats here too. SellMyTees will collect, hold and distribute the retail price and postage and handling fees (“sale proceeds”) from customers of affiliate stores. SellMyTees will deduct the base price, postage and handling fee and credit/returns (if applicable) from the sales proceeds of store products before distributing your margin, and tax where relevant, to you. An up-to-date report of sales that can be viewed from the store administrator page. There are two options to receive payment from SellMyTees: PayPal or Check. Payments are processed before the 15th day of the month for sales made in the previous month, in accordance with the payment method you selected on the website. 1. PayPal: 1) No transaction fee. 2) Payments transferred monthly into your account...No minimum. 2. Check: 1) Includes $5.00 administrative fee. 2) SellMyTees reserves the right to roll that amount over to the following month and continue to roll it over until store has earned at least $20(US). You may request payment at any time for the full amount in your account and a $5.00 administration fee will apply. Allow at least 7 days to process requested payments. SellMyTees will not be liable for any loss suffered by you if you provide us with incorrect details in relation to the payment method. It is your responsibility to ensure SellMyTees has current details of your PayPal email account and/or postal address. If we are unable to pay you because you have submitted incorrect details or your details are out of date, we will hold your margin for up to 12 months from the payment date. If you have not notified SellMyTees of any amendment to the payment method details in that time, you authorize us to donate your margin proceeds to a charity of our choice. You may close your affiliate store at any time by contacting SellMyTees via email at service@SellMyTees.com or via 'Contact Us' from within SellMyTees.com. The request must come from the address listed in the admin section for that particular store. SellMyTees will place your store as an ‘inactive’ account. At such time the store will not appear. Upon termination by either party, SellMyTees will pay you any accrued affiliate margin proceeds from your account, less a $5.00 administration fee. 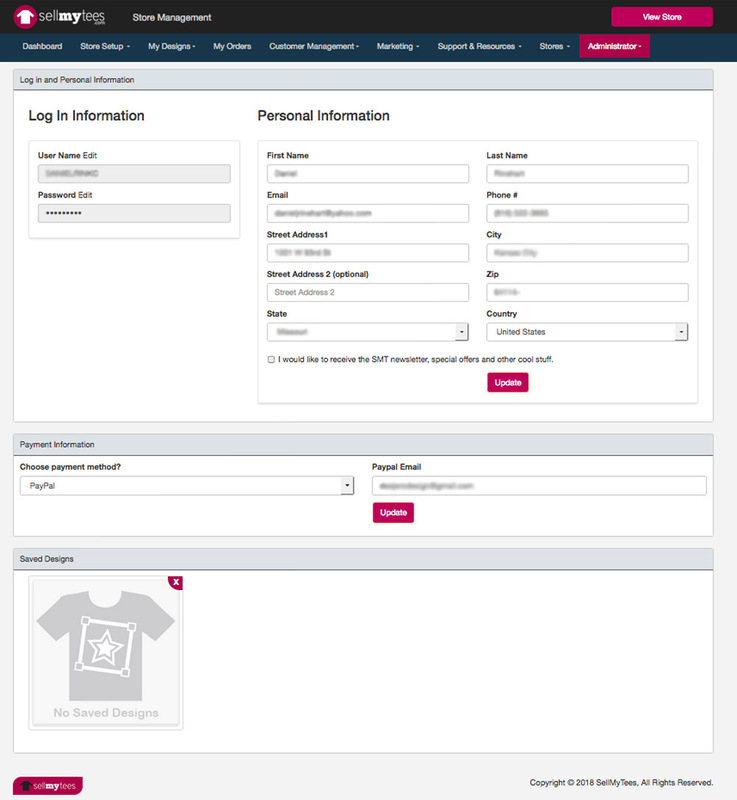 The 'Design Management' page is where the section is that allows you to adjust the price of the shirt and choose which items are available for sale in your store. To update Password, Contact Information and Payment Method (how to receive store earnings) click on the 'Settings' tab. It can be confusing logging into a store if you have a personal account and a store. When logging into a store be sure to enter 'User Name' and password. Do not enter email address in the 'User Name' section. You may be sent to your account rather than your store dashboard. When logging in to your account enter your email address and password. SellMyTees may not be able to confirm the identity of others that may use your store or prevent them from acting under false pretenses or in a manner that infringes the rights of any person. You agree that you will not disclose your password to any other person and you will not keep your password where it can be copied or used by anyone other than you. Change the password immediately if you suspect someone else knows your password. All item prices are set at wholesale...you decide the retail. Whatever you set as the 'mark-up'...that is what you profit. Bronze level stores are free however Silver level stores are charged a recurring monthly fee in the amount of $19.00 and Gold level stores are charged a monthly recurring fee in the amount of $79.00 for services and use of web site server. - If your credit card or PayPal account has insufficient funds to pay for a billing due to SellMyTees or it becomes invalid, you must either update a valid credit card in the administrative section within respective stores. If a new valid credit card is not available you must contact SellMyTees immediately and negotiate in good faith for alternative arrangements for making the payment. Contact SellMyTees via 'Contact Us' at bottom of SellMyTees.com home page, email at service@SellMyTees.com or call 1.800.659.2447. Failure to communicate to satisfactorily resolve any payment issue will result in suspension or cancellation of affiliate store(s). Suspension or cancellation under this clause will not relieve you of liability to pay all amounts then due. If any dispute arises concerning affiliates, both affiliate and SellMyTees agree to firstly attempt to resolve it by negotiation in good faith. If no settlement can be reached the dispute shall be submitted to arbitration in accordance with the Rules of Commercial Arbitration for the time being. During such arbitration, both parties may be legally represented. Nothing in this clause shall prevent your or our seeking urgent equitable or other relief before an appropriate court. A user can become an affiliate (store administrator) by setting up a password protected store. At that time you will be asked to enter a user name, password and store name. SellMyTees reserves the right to refuse any store name it deems inappropriate. SellMyTees reserves the right to refuse any person that it decides at its sole discretion from having store administrator status. By becoming an affiliate (store administrator), you appoint SellMyTees as a non-exclusive entity to market, sell, manufacture and deliver a product once an order has been made through SellMyTees web site. This is valid from the date of establishing a store and continues until the store closed and all orders processed. If dissatisfied with the service provided at any time you may discontinue your affiliate status. It's part of our no-risk customer guarantee. If it is found that store administrative rights have been misused or abused then SellMyTees has the right to cancel your store administrator rights immediately. SellMyTees does not warrant, endorse, make representations about or recommend any content or art offered or provided by any store. Three store levels are available on SellMyTees's site (Bronze, Silver and Gold). All stores all solely responsible for the designs offered. 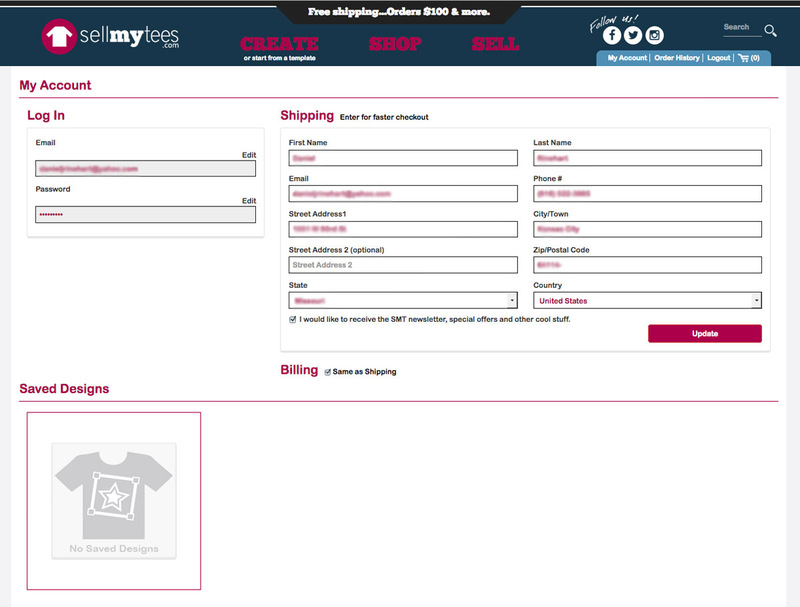 SellMyTees does not use designs of stores until a customer places an order. Bronze stores are free and use a SellMyTees skin. Some features include: 20 Product Displays, No Transaction Fee, Store Promotions, Art Service Discount, Basic Marketing Support. Silver stores have a $19 monthly fee and include a custom skin that allows the store to seemingly work independently while using SellMyTees engine to operate and process all sales. Some features include: 60 Product Displays, No Transaction Fee, Store Promotions, Art Service Discount, Featured Designs Displayed on SellMyTees Home Page, Advanced Marketing Support, Custom URL, Basic Analytics, Private Store Option. SellMyTees will collect and report any sales tax from any customer shipping to the state of Indiana. If tax, other than sales tax within the state of Indiana, is to be collected it is the responsibility of the the store to account for any taxes imposed by governments or governing authorities, and related accounting or audit requirements arising out of, as a result of, incidental to, or in connection with the use of this web site. It is essential all SellMyTees users respect copyrights. Only upload content you have permission to use. It is up to you to make sure you are not breaking any laws through use of SellMyTees. If you are a customer or browser, please respect the copyright of all the works you see or buy on SellMyTees. You keep the copyright of any content you submit or upload to the website. In order to receive the SellMyTees services you grant SellMyTees a non-exclusive royalty free license to use and archive the content in accordance with or as reasonably contemplated by this agreement. 1. You own all copyright in the content, or if you are not the owner, that you have permission to use the content, and that you have the right to display, reproduce and sell the content. You license SellMyTees to use and sub-license the content in accordance with this agreement. 2. You and your content do not and will not infringe the intellectual property rights or other rights of any person or entity, including copyright, moral rights, trade mark, patent or right of privacy. 3. You or your content, and your use, storage, reproduction and display on the website will comply with all applicable law, rules and regulations. 4. Your content does not contain material that defames or vilifies any person, people, races, religion or religious group and is not obscene, pornographic, indecent, harassing, threatening, harmful, invasive of privacy or publicity rights, abusive, inflammatory or otherwise objectionable. 5. Your content does not include malicious code, including but not limited to viruses, trojan horses, worms, time bombs, cancel bots, or any other computer programming routines that may damage, interfere with, surreptitiously intercept, or expropriate any system, program, data, or personal information. 6. Your content is not misleading and deceptive and does not offer or disseminate fraudulent goods, services, schemes, or promotion. SellMyTees reserves the right to review and if necessary remove any content from the website or to cancel your account at its sole discretion, either because that content breaches this agreement or any applicable laws, or otherwise.